In the Heavyweight Muay Thai main event on Fri, Oct 4th, Atlanta’s rising star, Warren Thompson, steps up to fight the bone crushing veteran Travis Lerchen in the biggest Bangkok Fight Night to date. In the co-main event, prepare for a clash of souls as Muay Thai sensation Steve “the Hitman” Hall and the ever exciting Anthony “Nightmare” Nieves put their records and reputations on the line for the grudge rematch. 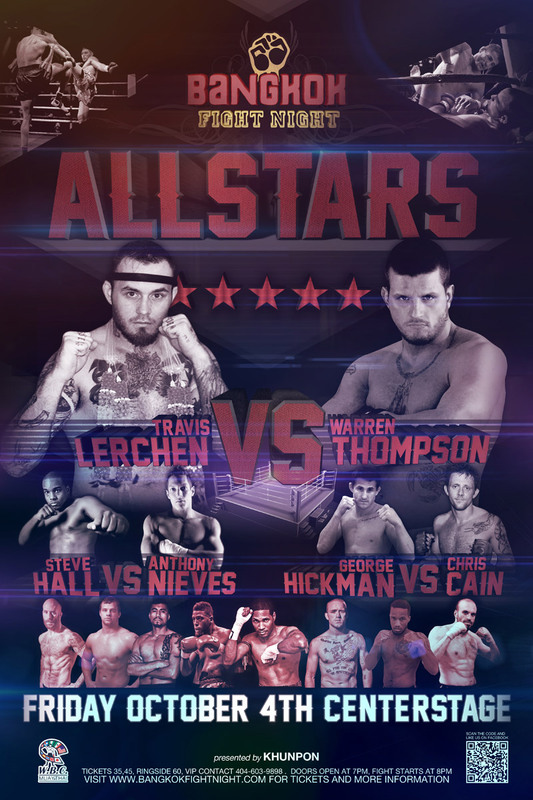 BFN stand-out George Hickman also steps up to fight MMA superstar, Chris Cain in an MMA superfight. Plus Stephen Upchurch goes toe to toe with Joey Carroll, alongside the return of Daniel House, Kit Ruddock and more. This is a Bangkok Fight Night you do not want to miss!